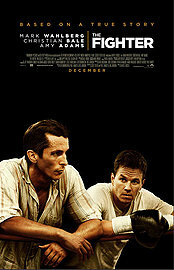 In the past week or so, there has been heat building over the Oscar chances for Paramount's The Fighter. The heat is mostly speculation from some awards watchers that it might have a shot to make up the half of a versus alongside The Social Network. Whether those chances hold any water now or in the future is beside the point. It must have the support because it's a pretty good movie, right? Solid reviews and Oscar buzz, big and small, have been surfacing since the film's first AFI screening in November. And yet, Paramount in their early commercials went down the dirty whore road again. An 85% approval rate and Oscar buzz from even well before its final cut was submitted and they could do no better than to have Peter Travers recycle the same quote from another Oscar winner? Travers is the big fish in this polluted pond of scummy bottom feeders; the one with so-called credibility because he works for a print magazine nobody cares is in print anymore. He gets to see the movies first and fashions reviews around quotes he has already given to the studios. Chicken and the egg really. If his reviews come first it hardly says much about his writing skills or hyperbolic insight into nothing. If his quotes come first, or he is simply placating a studio publicist with a pre-written thought that might look good coming from Rolling Stone, then he is just as untrustworthy as every other whore out there. For now, I am happily resigned to just think of Travers as a really bad critic. So what does that make these others? Pretty much lucky to be given a half-second of recognition because they had an adjective or two to say about Paramount's movie. "Aweskickfantabulous" There ya go. Lead with it for Transformers: Dark of the Moon. My quote for you. Haven't seen the film. Thought Revenge of the Fallen was one of the very worst films of 2008. If I had actually seen the completed film and thought enough of it to go all Palin on the English language, you might think that was something worth selling. This guy HATED the first two films and LOVED the third one. Think of how good it is. Marketers do not have the foresight to think in such terms though. For one it would require the knowledge of the consumer of who I was and what I thought about parts one and two. I don't have the benefit of being on a syndicated movie review program. At least, not yet. What moviegoers do have though is Criticwatch. And not only do they know the history of Travers but may recognize the other names in those Fighter ads. In previous years you would have found his name on such Oscar-winning masterpieces as The Benchwarmers, Underdog and Anacondas: The Hunt for the Blood Orchid. In fact, since 2003 the only film Toscano has pimped that has received an Oscar nod outside of the occasional technical nomination was Something's Gotta Give (where Diane Keaton got a Best Actress nod.) His adjectives mean nothing. Nor does Kelli Gillespie, whose idea of "a great summer movie" is a teenager who talks to his dead brother whom he's responsible for thanks to a car crash. Thanks Kelli. How many summers did you ruin with that one? And how about limiting your recommendations over what is a must-see. There are maybe a handful of those every year that are absolute musts. In no year are those films Red, Fair Game and Tangled. Paramount used Nancy Jay last year to on a little arthouse film called Star Trek which she called "the perfect film," as if it were the only such one in existence. Even Trekkers might smack her with the Wrath of Khan for that statement. She is also listed on their Megamind with the word "smart." What is the bill to fly-out this radio reporter and get such riveting commentary? "It sneaks up and floors you." "This spellbinder will sneak up and floor you. It's that good. A supremely intelligent and deeply touching thriller. Thunderously exciting!" Do you think playing Hide and Seek that Travers would run around shouting his presence will trying to creep up on people? Maybe Paramount really liked that phrase and asked if he could just say it again and sneak it into his review? After all, The Secret In Their Eyes won last year's Best Foreign Film Oscar. Maybe the connection will sneak up on voters and they'll be hypnotized into voting for The Fighter. Then again, that Travers connection works far less than they think. Paramount, you need to do yourself a favor and stop this nonsense. There are hundreds of more respected critics who like your movies. In 2011 Criticwatch will be starting The Travers Watch which will document which studios are using him the most. In this year's final wrap-up we will look at who has been the most responsible in using this worthless tool to hype their films. We see that you are already using him on True Grit. Let us hope that it is the last time. Because it is getting ridiculous how many times the studios prop him up after we knock him down.